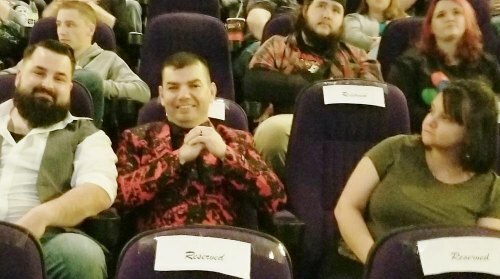 A hot and grizzly locally made horror film had its big screen premiere at Marquee Pullman Square preceded by a meet-and-greet outside at the Pullman stage. Producer/Director Sam Hodge revealed a "spoiler" withheld from the prior story --- the entire movie was shot on an I-phone camera. Hodge explained that the smaller camera tended not to make first time actors nervous and it was great moving it into tight spots. Twelve Pole was shot over about eight months during periods (weekends) when cast members had free time. Hodge confirmed that the locally made horror film will have a screening soon at Marquee's Southridge Cinema in Charleston. It has also been entered in numerous film festivals. Some declined it due to the 70s/80s era "gore."